My bosses threw summer a going away party by organizing a beautiful beach picnic for their employees last weekend. Although the kayaks and paddleboards must have scared the mermaids away, I did spot a stunning sunset that I'll share tomorrow for Wordless Wednesday. I turned to Beadmask for siren stories instead. 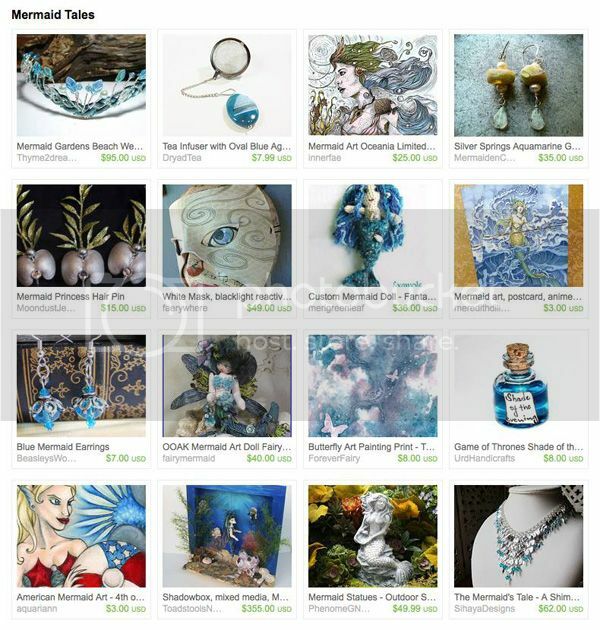 Her mermaid gift ideas from the Fantasy Artists of Etsy include beach wedding tiara by Thyme2dream, mermaid art postcard by Meredith Dillman and my American mermaid art magnet. Awesome mermaid collection. And I do love my blues, so even better! What a mystical treasury! :) Love it! Wow. What a stunning sun set. Great treasury!! Love the Mermaid theme.